Milwaukee County Zoo | Meet the New Red-Billed Hornbill Chicks! Meet the New Red-Billed Hornbill Chicks! The Milwaukee County Zoo has been successful again breeding red-billed hornbill chicks (tockus erythrorhynchus). The Zoo welcomed a clutch of four chicks on 13 October 2012. 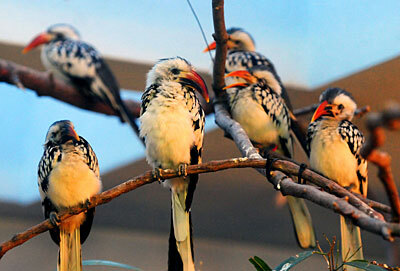 At this time, the Milwaukee County Zoo is one of the only North American facilities breeding red-billed hornbills. The Zoo has another set of red-billed hornbill parents who have produced six clutches, 15 chicks total, over the last six years. Red-billed hornbills undergo a very interesting nesting process. In their natural African habitat, female red-billed hornbills build a nest in tree cavities, sealing the nest with water, mud and feces. The female completely seals herself into the cavity, leaving only a narrow vertical slit, through which the male passes food to her during the next four weeks of egg incubation. She is entirely dependent on him for her food source. Once the eggs hatch, the male continues to pass food through the small, narrow slit, feeding mom and the chicks for the next three weeks. At about the six-week mark, mom will break out of the nest cavity, re-seal it - leaving a narrow slit for feeding - and then team with dad as they both bring food back to the chicks through the small cavity opening. When the chicks are fully fledged, chicks will emerge from the nest by breaking through the narrow slit. Sometimes, they also get a little help from their parents during this process. The Milwaukee County Zoo’s red-billed hornbill family nested in a wooden box constructed especially for them, by Aviary keepers, in order to help mimic their natural habitat. You can see the new chicks daily, in the Herb and Nada Mahler Family Aviary.